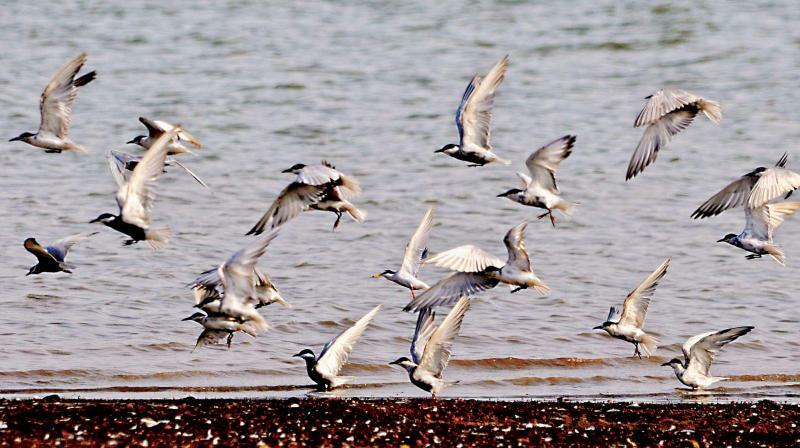 Bengaluru: The city, which has of late woken up to mass fish kills in its sewage filled lakes, is also seeing fewer migratory birds making their way to them owing to the incessant destruction of their habitats on their banks and rising pollution, say bird lovers. A bird photographer, Saneesh Radhakrishnan, recalls the many species of birds that were once spotted around the lakes in the city. “We saw the Northern Shoveler, Garganys, Black Redstart, Wood Sandpiper, Grey Wagtail, Common Swallow, Brown Shrike, N. Pintail and Greenish Warbler around them in the past, but due to unplanned urbanisation, climate change and incessant cutting down of trees we are seeing few of them now,” he laments. “Motorists do not realise that continuous honking disrupts wildlife. I removed the horn from my bike around three years ago and urge everyone to do the same. The onus is not only on the BBMP to protect our birds and animals , but also on the people,” adds Mr. Harsha. To emphasise their point, the bird lovers point to an international study by the Boise State University in Idaho, USA, which says that birds exposed to traffic sounds lose body weight during migration, a period when they are supposed to gain fat to fuel their long flights. Ms Samhita Kashyap of the People for Animals, Bengaluru says it is important to make people aware about the importance of birds in balancing the eco-system. “They eat insects which are a natural way to control pests in farms and garden,” she points out.